As time moves on and the children of today see more world wide conflict, the first World War fades into a history that few understand or even try to. But so much of what happened in the first world war is still relevant today. Soldiers weren't the only ones who suffered during the war. Those left behind had endured food shortages and rationing and many civilians died from malnutrition or disease. Writing from a British point of view, Eldridge mentions the battles in Turkey and the Middle East but glosses over the far reaching effects of bringing the war to the region. However, he does a good job introducing events that led up to the first world war while leaving the reader with plenty of questions that call for further research. 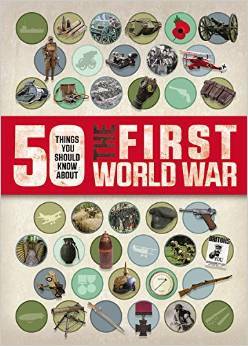 An excellent resource for introducing reluctant readers to the first World War.